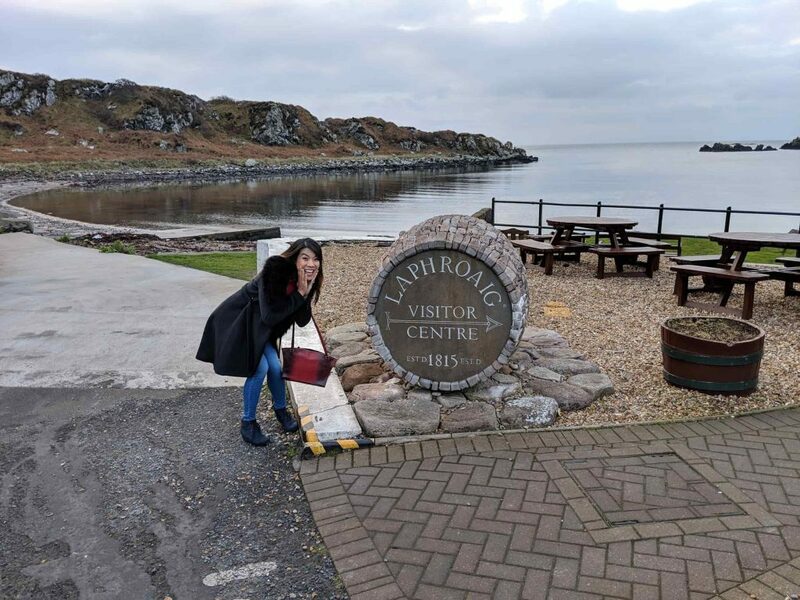 Visiting Laphroaig feels like stepping back in time. The white and green trimmed distillery sits in the middle of a dark wooded forest a short ways from Port Ellen on Islay’s Southern coast. 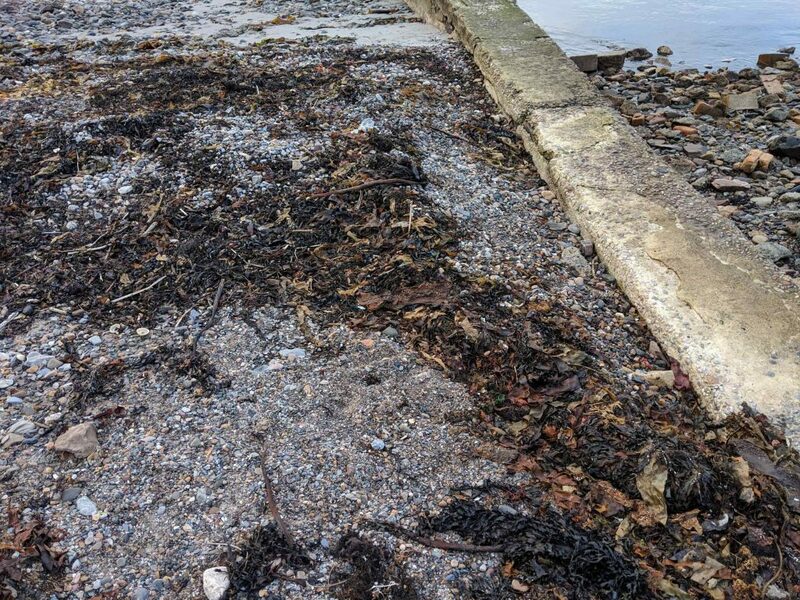 Laphroaig, Lagavulin and Ardbeg sit just a mile apart and one could easily visit the three distilleries in a day via a newly-installed pedestrian path. One would, however, not be sober at the end of the endeavor. The trio all came into being in the early 1800s, emerging from the illegal spirits trade and coming into the light (and taxing regiment) of the UK. We opted for the two hour distillers’ wares tour, starting bright and early at 10AM. 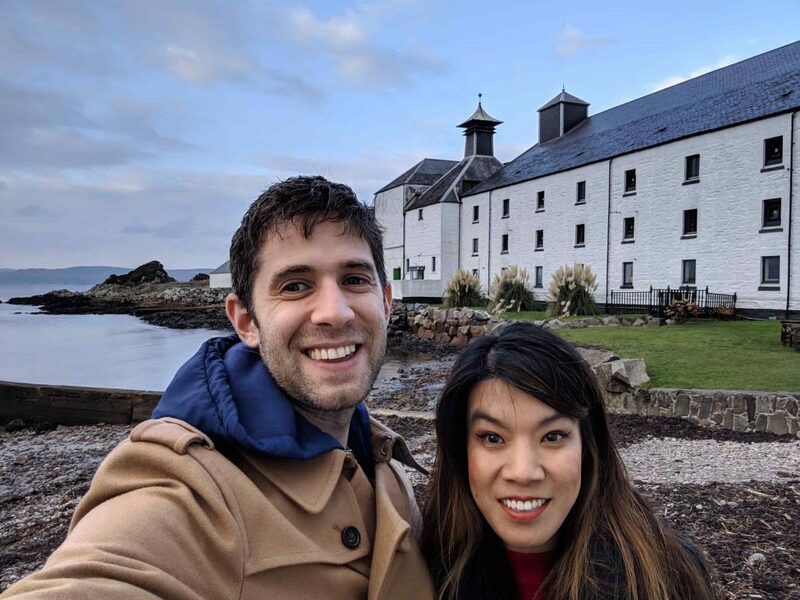 The tour started along the cost, looking at the geology and early history of the distillery, including a crazy period in the early 1800s when a rival distiller started a competitor attempting to make a “better Laphroaig” by choking off the distillery’s water supply and using it for themselves. Fortunately, the competitor had to continue to let the “river” (creek) flow, and they soon went bust. Laphroaig still floor malts 10-15% of their barley. 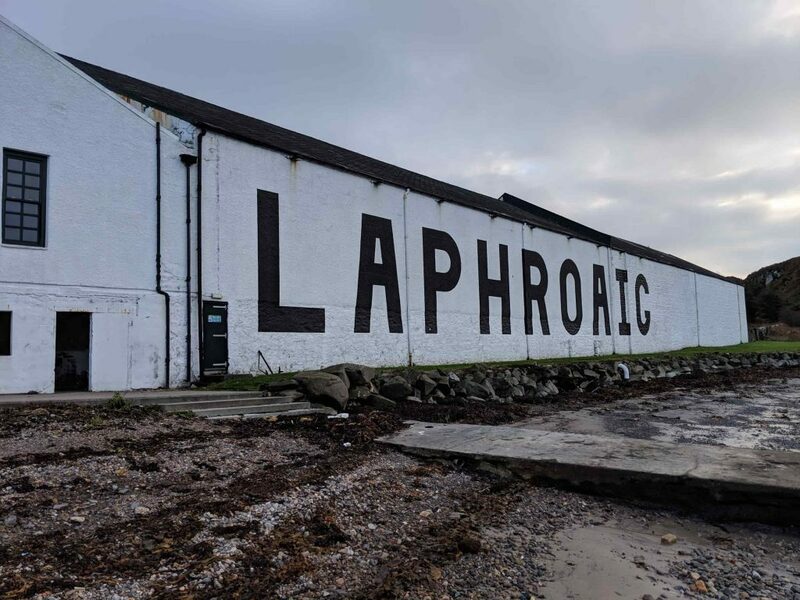 Laphroaig is one of the last distilleries in Scotland to floor malt barley. The process is labor and space intensive as you the grain must be turned every few hours to prevent it from developing mold and sprouting a barley forest. 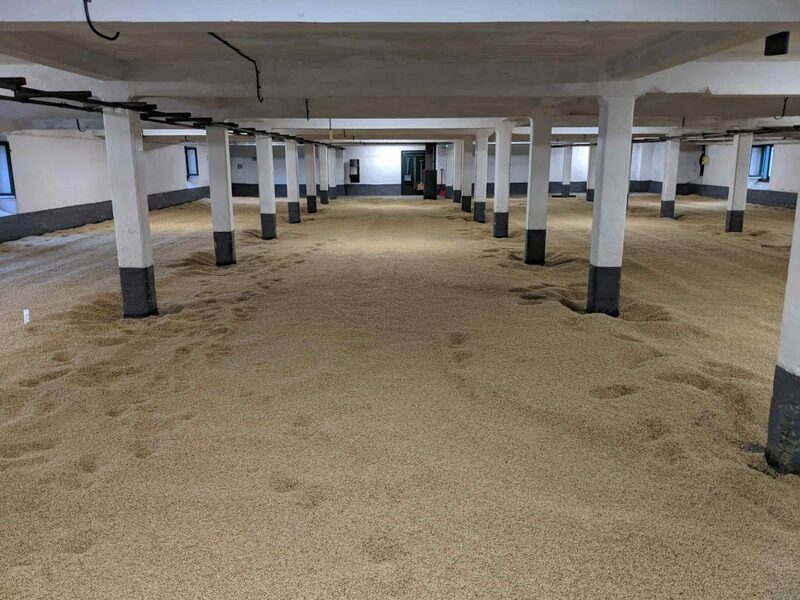 An estimated 10-15% of the final mash bill is floor malted barley, with the rest coming from the Port Ellen plant down the street. After visiting the malting floor, we popped a floor upstairs to the kilns where the damp barley is exposed to a long, low-temperature smoke. Our guide James closed with an explanation of Laphroaig’s hand peat cutting process which he praised as more sustainable than the mechanized approach of modern distilleries (sidenote: this is for the 10-15% of Laphroaig’s peated barley but their other peated barley comes from Port Ellen, which does in fact mechanize). 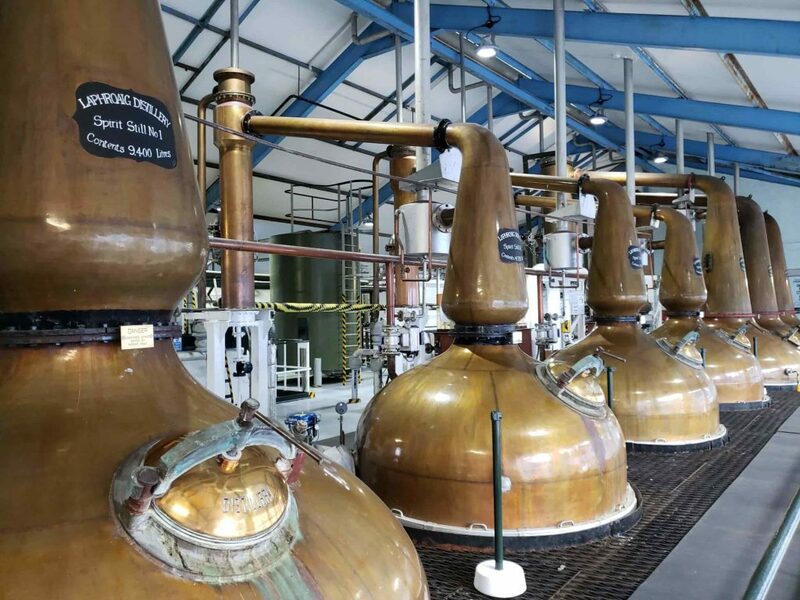 The last leg of the tour was to Laphroaig’s famous odd number of oddly configured stills. One of the most unusual aspects of the distillery is that the still’s lyne arms (condensing ports) go up rather than down, making it a struggle for the heavier components of the distillate to make it into the spirit. As a result, the signature taste of smoky and peaty light vapors are more pronounced. Note the upward-pointing lyne-arms on the wash and spirit stills. By this point we were getting woozy from lack of alcohol, but thankfully we were escorted to the warehouse for tasting. 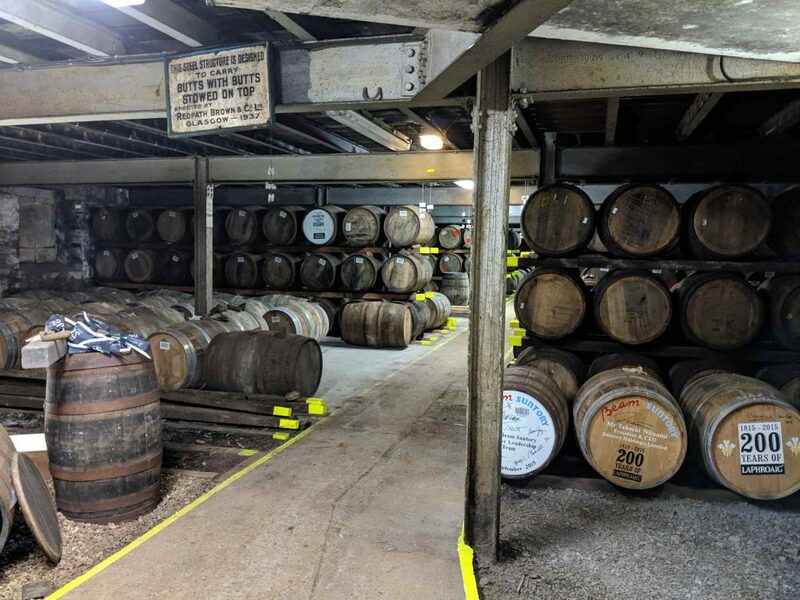 We tried three drams from three very unique casks. Honestly if you’d put a gun to my head I don’t think I would have identified any of the drams as Laphroaig. The tour concluded with the opportunity to fill a miniature bottle of our favorite cask (in our case: #2 and #3). The cask was bizzarely initially in a sherry cask and finally moving to a bourbon cask. I got olive oil off the nose and a little peat, much less than I would have expected from Laphroaig. The cask strength whiskey hit me in the back of the palate with a big hit of iodine and with notes of cheery and chamomile. It was a hot dram with a long smokey finish. This had a nose of toffey, butterscotch and light smoke. The palate gave a big, immediate hit of peat at the front, fading into cherry and caramel. Lastly the dram had a long honey and peat finish. This was my favorite expression. The last dram had a nose of raisins and smoke, was full with notes of caramel and vanilla on the mid palate, and had a quick, slightly smokey finish. 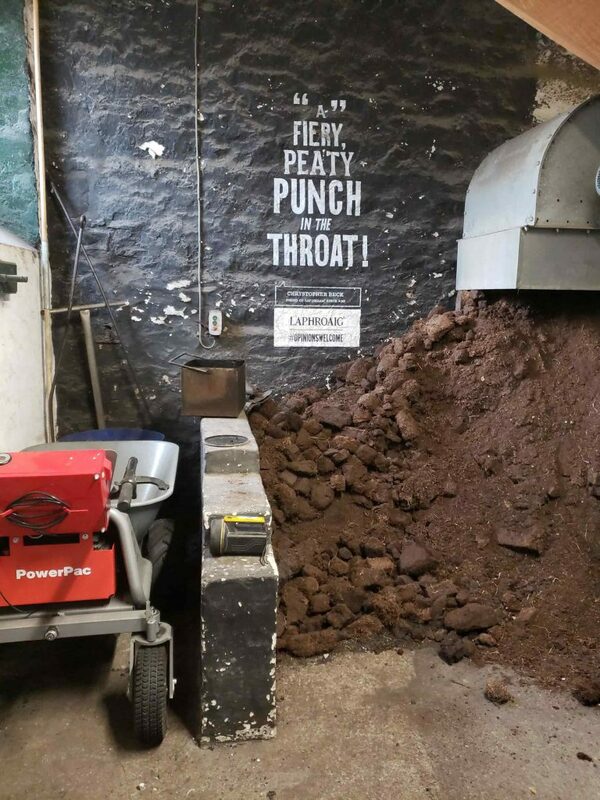 Hand-cut peat and Laphroaig’s genius marketing campaign: embrace the peat!